Locals and visitors alike descend on Gallup’s pedestrian-friendly downtown corridor on the second Saturday of each month for ArtsCrawl, which celebrates the city’s rich artistic heritage. Many fine art galleries stay open late and open new exhibitions in conjunction with the event. As kids create chalk masterpieces on the blacktop during the summer months, area dance troupes take to the streets and local bands serenade the crowd. You can grab a delicious treat from a food vendor, and engage with local artists as they work along the promenade. What the green-chile cheeseburger is to the rest of New Mexico the Navajo burger is to the state’s northwest highlands. This Native take on an American classic replaces the traditional bun with fry bread, a puffy round of deep-fried dough. Navajo tacos, which substitute a piece of fry bread for a hard or soft tortilla shell—as well as blue corn and whole-wheat fry bread—are delicious variations. Locals swear by the Navajo burgers at Earl’s Restaurant (see #14) and Jerry’s Cafe (see #9). Gallup is perhaps best known for its many iconic trading posts. Scattered all over the city, they offer curated selections of Native American jewelry, rugs, kachinas, pottery, baskets, and more. Browse case upon case, room after room, until you find exactly what you’re looking for. Richardson’s Trading Company (222 W. 66th Ave.; 505-722-4762); Bill Malone Trading Company (235 W. Coal Ave.; 505-863-3401; friendsofhubbell.org/Malone.htm); and Perry Null Trading Company (1710 S. Second St.; 505-863-5249; perrynulltrading.com) have great reputations for authenticity, friendly staffs, and fascinating offerings. Gallup and the surrounding area boast more than 50 miles of single-track bike trails that cut through some of the most beautiful scenery in the Southwest. A hot spot for competitive mountain biking, Gallup hosted some of the nation’s best racers when the USA Cycling 24-Hour National Championships came to town in June; the event returns in 2014. The city is home to several other races throughout the year, including the Squashblossom Screamer and Dawn ’til Dusk. 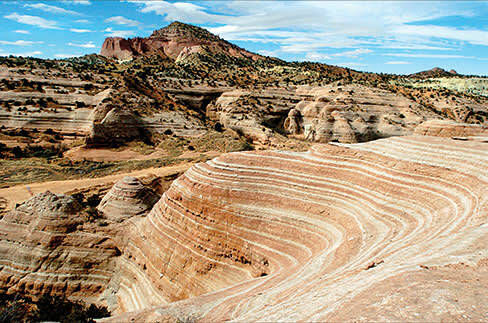 Challenging and beautiful hiking terrain is plentiful along the High Desert Trail System. Pyramid Rock is Gallup’s most iconic natural feature, and the hike there winds past caves, rock formations, and even, on lucky occasions, a waterfall. The nearby Mentmore Climbing Area is rich in sandstone outcroppings for rope- and sport-climb enthusiasts. Trail information and maps are available at adventuregallup.org and galluptrails2010.com. Gallup’s many downtown galleries serve up everything from the traditional to the eclectic. If you’re looking for Native American beadwork, pottery, paintings, or kachina dolls, Nugget Gallery (1302 S. Second Street; 941-387-4993; nuggetgallery.com) is a must-see. Hopi-Tewa artist Stetson Setalla’s colorful hand-coiled pottery bowls are a fixture there. Makeshift Gallery, a locally focused, affordable artists’ cooperative (213 W. Coal Ave.; 505-722-8886; makeshiftgallery.info), carries vintage clothing, metalwork, ceramics, jewelry, photographs, and recycled art. Blacksmith John Thumma’s whimsical horseshoe pieces run the gamut from trivets to earrings and business-card holders. Another artists’ cooperative, Art123 (123 W. Coal Ave.; 207-522-9107; on Facebook), opens a new exhibit each month. The Saturday Flea Market, held on N. Ninth Street, just off U.S. 491, is Gallup’s one-stop shop for interesting odds and ends. Browsers can find great deals on Native American jewelry, pottery, clothing, saddles, and other handmade items. It’s also the best place in town for delicious and authentic Native American cuisine. Try a cup of mutton stew, kneel-down bread, or roasted corn. The market is open from 8 a.m. to sundown every Saturday. On Facebook.